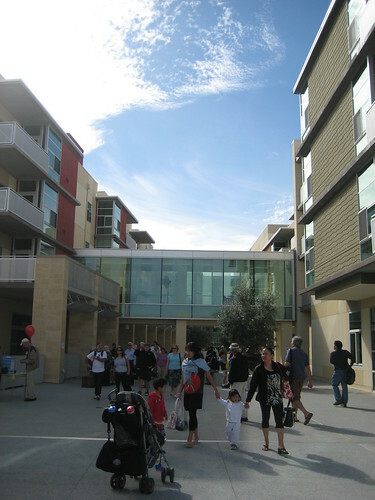 At the risk of sounding schmaltzy, let me say that the SF Peninsula’s new Oshman Family Jewish Community Center, which had its grand opening yesterday, is an admirable stab at making up for what we lack in contemporary American society: non-institutional housing for the elderly, daycare for the toddlers, a state-of-the-art gym–all wrapped up in an architecturally interesting package. My friend Angharad, who lives nearby and has three boys under the age of 5, said wistfully, “I mean, I could be Jewish.” This eight-acre town-within-a-town is located on the southern edge of Palo Alto, where the built landscape devolves into the giant office park that is the South Bay. 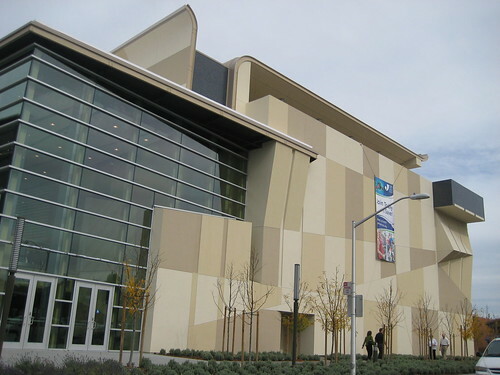 It introduces high-density housing right off the freeway and a fresh breath of modernity (by San Jose’s Steinberg Architects). It’s got the look and feel of a mixed-use project, with apartments overlooking a central pedestrian thoroughfare that meanders past sculptural benches and palm trees in giant planters that are taller than a person (by SF landscape architecture firm CMG). Walking around town, one level up. But by design, the complex is also insular and inwardly focused, without a welcoming street presence. Everything has been raised above street level. This was the architects’ response to the site, a brownfield. So the parking is at-grade, while the town is above—and pedestrian access is only through two points along the whole perimeter, up staircases. (Given the $300 million budget, was excavating to remove the toxic soil truly out of the question?) Along the main facade (shown in the first picture above), no amount of graphic razzmatazz can change the fact that you’re looking at a monolith at the primary intersection. Maybe it makes sense for a cineplex, but for an urban village, it’s offputting. A cafe is supposedly on the way, but will be tucked inside the complex. Imagine the difference if there was a bagelry at street-level on that southwest corner. Maybe it’s too much to ask of any particular community, to be friendly to everyone. It’s just that the ambitions of the project—the complexity of the plan and all the parts it’s tried to integrate architecturally—make you wonder whether they could have tried just a bit harder to bridge the divide between their town and the town at large, the chosen and those merely passing by.